Wow! I love your word and the acronym! I am going to study all this for myself. I haven't received my word yet. I have had several come to mind, but none of them seem to be the one word I could focus on. Maybe I will receive a word. In the meantime, I am going to enjoy your word and acronym. I am so blessed by your words! I know what you mean, it seemed that it took me a while to really get clarity from the dear Lord, but when it came, it was crystal clear!! Yours will be the same. Love you! I love the word and acronym!!! Something that is so applicable to all of us!!! When I saw that you had a new post, and that it was about your *word* - well, I got all excited. I didn't want to rush my reading, though, for your words are always so full and meant to be pondered over. But when I finally read your word, I smiled. Something in my soul whispered, "Yes, Lord, that's perfect." I love how He brought it to you, as I knew He would. I love your acronym (I'm a fan of those myself!!). I love the way you broke down so many layers of nuance contained in your word. It's a good one. A challenging one, and yet a greatly hopeful one. I am joining you this year in whatever God brings. May He prepare us well for His purposes, and may we let go of all that might hinder our obedience. Me again! I got my word because I was able to use some other words as part of the acronym. This post gave me that idea. I have just written a post about it. Hooray! Hallelujah!!!!! I am so excited for you and can't wait to read that post!!! Will be over soon to check it out. God is SO good. Love you! Wow… Good word, sister. That's not arbitrary! Oh, brother! How I DO understand what you mean by that. I can remember so many times of my tears falling and hitting the floor right beneath my face, as kneeling didn't even seem to be enough. I can't thank you enough for your visit. Your words are always such a blessing and encouragement and so edifying. God bless you! I just wonder why we are feeling this need to be prepared? It could be that Jesus' coming is even nearer than we think. What an exciting time for the believers! God is going to do some great things this year, if we will all just stay surrendered to Him! Thank you so much for your dear, kind comments...they always mean so much. God bless you!! Wonderful post, and great acronym. I look forward to hearing how your journey pans out and sharing with you in the excitement and anticipation as God prepares you for that journey. Each year brings new things in God for all of us. Thank you for sharing your heart with us at Good Morning Mondays, always a blessing. Thank you so very much, Terri. I so appreciate your words of encouragement! I am looking forward to the journey, too, and so thankful to have you walking by my side. God bless you abundantly!! I LOVE your acronym! It's amazing how much God can roll up into one little word. Prepare is such a great word and your lesson examples that fit so well. My word for 2015 is FAVOR. I desire favor with God and man, and most of all to have his favor over decisions that will need to be made. A door has been closed for me and I am praying for a new door to open where there is favor. Thank you for sharing your sweet words with us here at Tell me a Story. Oh, Hazel! I trust the Lord will open the right door...wide...where it will be obvious that you are to walk through it. And may He grant you that favor with God and man and enlarge your coasts as never before. Thank you for your comments here and for your encouragement and support. God's best to you! Wonderful acronym and word! This is very inspiring Cheryl! Thank you for taking the time to share this with us! Thank you so much, JES. And thank you for the weekly link-up. It is always a joy and blessing to stop by your place. God bless you! The way that He can infuse such clarity in the boundless meaning of a word is exemplified here, Cheryl. I love it. There is even more to that word, as God unfolds it to you over this year. I understand that longing to go deep and to wait on Him to show you where He wants you to focus, how He wants you to prepare. What an encouraging post today. Thanks! Thank you so much, Dawn! I love the thought that there is even more to that word. I look forward to seeing what God will further reveal through it. I am so thankful for your visit and kind words today. God bless you! Great post. 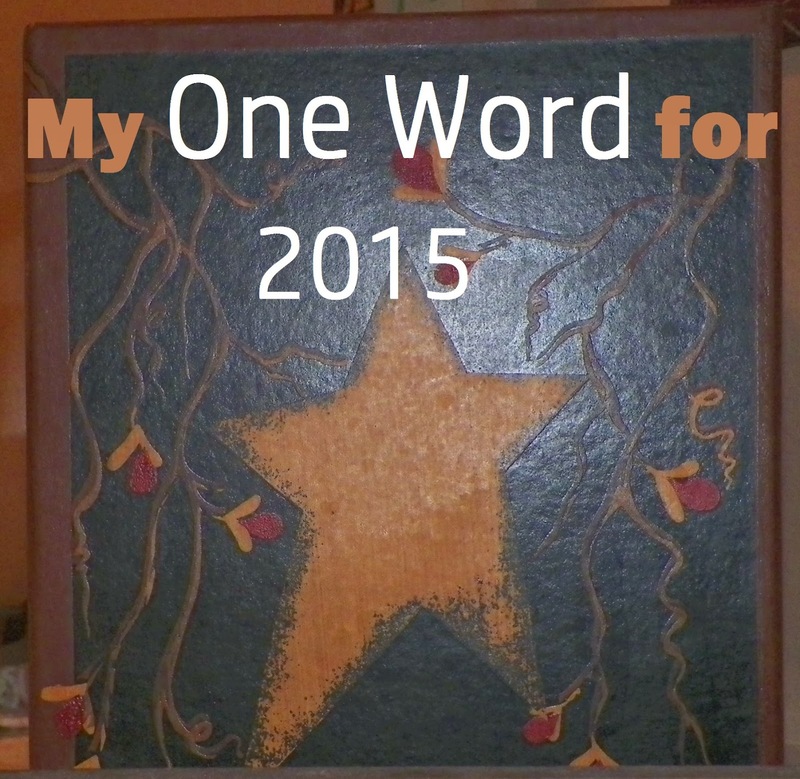 My one word for the year is MORE. As in more of Him less of me. Cheryl, I love your word and the way you arrived at it. I could spend days soaking up wisdom and truth from each section of your acronym! Thank you so much, Tarissa! So very thankful for your kind words and encouragement. :) Come back anytime! God bless you.